Most readers here will be of an age to remember the urban myth fad that made a modest impression on the pop consciousness back in the late 90s/early 2000s. If you were clever, you noticed the subtle but significant change from the former academic term "urban legend" to the media-promulgated "urban myth". The game was to further cut off people from their culture's founding myths by associating "urban legend"--which means "false story"--with all myths. If we'd dug a little deeper into the media products associated with these and other NY and LA-manufactured fads, we might have unearthed the sinister seeds that have since bloomed into total cultural havoc. But then, the 90s were notable for being the decade when no one was paying attention. The demythologizing urban myth fad came and went without fanfare, leaving no lasting mark except a further hardening of the public's hearts against the value and necessity of myths. But the trend was fairly extensive at its height. There were books, a show on MTV, and at least one Hollywood slasher flick cashing in on the horror self-parody craze in the wake of Scream. The urban myth fad's appearance in film is relevant, since it brings up a story that proves not all urban myths are entirely false. 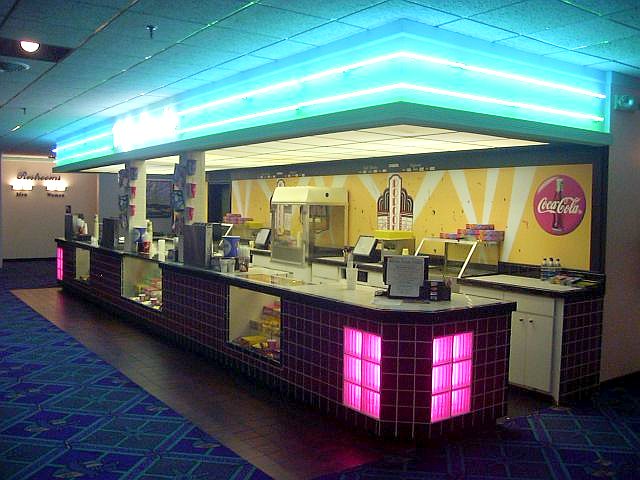 In my misspent youth I did a brief stint as the assistant manager of a local movie theater. It was one of those middle evolutionary steps appended to malls and recreation complexes in mid-sized cities in the years between the demise of the grand old one-screen theater and the advent of the multiplex. This particular theater started out as a five-screen house, and sometime around the early to mid 90s--the last movie I recall seeing in the theater's original configuration was Jurassic Park--expanded to a twelve screen multiplex. They got the extra room by building a large new addition in what had been the parking lot. This detail will come up again later. Spend any amount of time working in any kind of theater, whether movie, Broadway show, summer stock, etc., and you'll meet at least one old hand who'll tell you that every theater has a ghost. I've worked at multiple such establishments over the years, and inevitably there'd come a slow night when the general manager who'd worked there since high school--you could still work your way up in a company to a job that paid a living wage back then; a guy I knew started out mowing lawns at the theaters in this chain and eventually made vice president--would come down from the office and fraternize with the staff. And he'd always have at least one personal account of something weird happening in the small hours while he was splicing reels together up in the booth. When I made my own move from the booth to the office at the theater in question, there'd already been freaky stories circulating among the staff for years. Take the time when the opening manager came in first thing in the morning and found a ski glove stuck to the top of the screen in auditorium two. You're probably thinking, OK. What's the big deal? Some pothead booth op or class clown usher glued it to the screen the night before after everybody else went home. Case closed. And you'd think that because you don't know how closing and opening procedures at a modern movie theater work. Closing starts with the concession stand. The concessionists are supposed to wait until the last show of the night is well underway to start closing--at least they were in my day. Recently I've come out of 7 PM showings hankering for a refill only to find the concession stand closed. I pin the blame on helicopter parents in a huff over their little snowflakes coming home at 1 AM smelling of butter-flavored canola oil. Once the final show of the night gets out, the last ushers on duty will sweep--and if necessary mop--up the auditoriums before calling it a night. Then it's down to the closing manager to make sure the night's take is counted and locked up in the safe along with tomorrow's concession and box office drawers. The closing manager is supposed to do a final concession and theater check to make sure the concessionists and ushers didn't leave a mess. He also makes sure that everything is securely locked up, including all entrance doors. Now, the closing manager isn't the last one to come or go from the building between closing and opening. Keep this detail in mind for later. Ushers clean theaters between sets and after the last show of the evening, but they're not equipped or paid to tackle the kinds of heavy duty messes that movie theaters see throughout the course of the day. For that, most theaters hire janitorial services to come in after hours to perform more thorough cleaning duties. The closing manager on The Night of the Glove was a dude named Jason. He was also the lucky stiff who got saddled with opening duties on The Day of the Glove. He came in, walked the building in a repeat of the closing checks he'd done the night before, and found this glove stuck to the screen in a theater he'd just checked a few hours ago. Jason waited until the morning crew arrived and called a meeting. As it happened, some of the openers had also closed the night before. "Did you notice anything odd in theater two when you swept up last night?" That's how Jason had found it on his closing walkthrough, yet there was the glove clinging to the screen like some kind of huge rayon bug. He called the staff into the theater, and they were all gobsmacked. Because here's the other weird part. Auditorium two is the biggest in the house--almost as big as one of the old single-screen theaters. It took the tallest guy on duty standing atop the tallest stepladder in the house to get the glove off the top of the screen, and he still had to use a broom handle to reach it. When they got the glove down, there was no adhesive of any kind left on it or the screen. Thy guy who'd knocked it down said it had felt like knocking a magnet off a refrigerator. And no, they didn't find any magnets inside the glove. They did find its mate in the box office lost and found, where it had apparently been since winter--The Day of the Glove happened in the summer. They mystery had only deepened, so Jason went to the security tapes. He checked the footage from the night before and did find something strange. There was no sign of the janitor who should have come in after him. He called the janitor, and the guy abashedly confessed that he'd overslept--read: had gotten trashed and passed out on his girlfriend's couch. Perhaps you're tempted to accuse Jason of protesting too much, but company policy at the time dictated that at least one other employee attend the closing manager. In this case, it was a rather level-headed girl who wasn't given to pulling pranks and who was 2/3 the height of the guy who needed a ladder and a broomstick to remove the glove. She also confirmed that it hadn't been there when she and Jason had locked up for the night. Other anomalies continued to be reported in theater two, including the recurring phantom odor of cigarette smoke that yours truly also witnessed. But that's just the prologue. Theater two was part of the new addition built on the parking lot. By far the weirdest stuff took place in the old part of the building. The year after The Day of the Glove, my theater played host to a series of strange events in the fall and early winter. The most pertinent events for our purposes revolved around an employee named Chris. That industrious yeoman had taken to supplementing his job as a booth op by moonlighting as the janitor (not the same janitor as in the last story). Chris quickly found that it wasn't worth his while to close down booth, go home, catch an hour or two of shuteye, and head right back to deep-clean the theater carpets. Instead he took to passing the time between the completion of his booth op duties and the donning of his janitor hat by threading a projector with a movie of his choice and treating himself to a private showing. One late night right around this time of year, Chris finished up in booth shortly after the last show let out. He assisted the manager as the mandated second closing employee and made double sure that all the doors were locked up after the boss left. After all, he wanted to enjoy his private screening in peace. Satisfied that the premises were secured, Chris went back up to the booth and threaded a flick in projector number eight. Being an old hand at the complicated setup process that predated digital projectors, Chris had the film ready to go in no time. He started the projector and hurried downstairs to theater eight. It's worth noting that theater eight and its projector are in the old, pre-renovation part of the building. The original concession stand, relegated to a backup since the cinema's expansion, lies a few feet down the hall from theater eight. Chris found his favored seat in the secluded corner right next to the truncated wall that juts out into the aisle from the auditorium entrance. He'd done his job well, and the movie was running without a snag. He sat back to unwind and fortify himself for the waiting janitorial work. Fifteen minutes in to the film, the telephone in the back concession stand rang. Chris checked his cell phone. It was just after 1 AM--rather late for a customer to be calling for show times, but not beyond the pale. He ignored the phone, which eventually stopped ringing. Sometime in act two, the back concession phone rang again and kept ringing despite Chris' resolution to ignore it. Contrary to the misconceptions of some moviegoers, you can't pause or rewind a film projector like a VCR. But the second call had Chris thinking that the manager was calling with some kind of urgent message, like he'd locked his keys inside or something. Why he'd be calling the concession phone, Chris didn't know, especially since the manager had his cell number. Then again, he knew about Chris' penchant for late night flicks. Maybe he'd figured that Chris' phone would be off and calling the house phone closest to the theater was his best bet. There was only one way to find out. Chris grudgingly left the auditorium, jogged over to the concession stand, and picked up the phone. He gave the canned company greeting. No reply. After a couple more failed attempts to communicate with whoever was on the other end, he hung up and tromped back to his movie. No sooner did Christ settle back in his seat than the phone rang again. Royally pissed by that point, he got right up, made a beeline for the concession stand, and snatched the phone off its cradle. It should be noted that not even a strange voice on the phone whispering to Chris that its owner was watching him was enough to creep him out. Instead he just got madder, because he figured that some drunken kid on a cell phone was loitering outside, peeping through the old lobby doors, and playing stupid games. He put the handset down and walked across the attached lobby to share his displeasure with the dipstick interrupting his movie time. The old lobby has wall-to-wall glass doors that give excellent visibility. Chris got to the doors, and there was nobody. Just an empty parking lot. He still wasn't scared yet, just confused, so he went back to the concession stand and checked the phone. Whoever was on the other end hadn't hung up. Chris looked closer and saw, I kid you not, that the call wasn't coming from a cell phone. It wasn't coming from outside at all. It was coming from the booth extension. The projection booth at this particular theater is composed of the original booth serving the five older auditoriums with an expansion added on for the newer screens. The result is one long room bent in an L shape. There are only two ways in or out--one flight of stairs near theaters five and six in the old section and another flight next to theater two in the new addition. Both stairways are accessible only through automatically self-locking fire doors. Chris knew that better than anybody, and the added knowledge that someone was up in booth--the phone is on the wall next to the porthole overlooking theater eight--spying on him finally gave him the creeps. He rushed to the booth door near theater six. Locked. A mad dash to the other entrance by theater two revealed that both doors were locked, just like he'd left them. A whirlwind tour of every entrance to the building turned up the same result. The whole house was locked up tight as a drum. And Chis was locked in there with a peeping prank caller. There's a wooded hill between the back of the theater and the interstate below that's a popular camping spot for hobos. Chris connected the dots and reached the unsettling conclusion that a vagrant had gotten into the last show and stuck around afterwards--probably hidden in the masking valance under the screen. After all, it was cold outside. Where better to spend the night than a nice, heated theater? He thought of calling the cops, but he wanted to be sure. Chris didn't fancy confronting a potential murder hobo by himself, so he called the other janitor who alternated shifts with him. To his credit, alternate janitor came right down. After making doubly sure that all the entrances were locked, they did a thorough sweep of the ground floor and turned up zilch. That left the booth. Unless the hobo had somehow gotten a hold of some keys, he had to be up there. Chris and his associate entered the booth from the old and new doors, respectively and searched the long room, meeting in the middle. They found no one. As for the phone near projector eight, the handset was resting snugly in its cradle. Both janitors reluctantly chalked the whole episode up to a glitch in the phone system, completed their cleaning duties in a hurry, and left for the night. The next day, Chris reported the incident to me and the general manager. We reviewed the security camera tapes. Nobody turned up on the footage who shouldn't have been there. According to the cameras in the hallways and the old lobby, Chris had been alone from the closing manager's departure till the other janitor's arrival. The GM called the phone company, who weren't much help. When another phantom call in the night came a couple weeks later, we finally got the cops involved. I wasn't privy to the investigation, but nobody got fired--which would have happened if the culprit had turned out to be a key holder messing around--and to my knowledge nobody got arrested. An informal policy requiring someone to stick around until the night janitor finished up was implemented, but there were at least two more incidents. Here's the moral of the story: the next time you see someone posting a "The calls are coming from inside the house!" meme, remember that sometimes they are. Want to read something really scary? 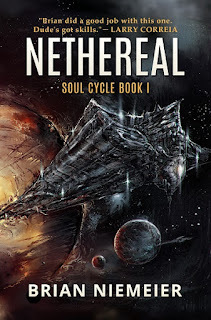 My space pirates in hell novel Nethereal is on sale until Halloween for only $0.99! Very interesting. I've always been wondering if the ghosts are really demons. I'm going with Hebrews where St Paul is categorical about being judged once. Very fascinating and reinforces the truth: myths aren't lies but express very deep truth about good and evil as well as the human condition. Glad you enjoyed the post (kudos for boldly asserting Pauline authorship of Hebrews). As for explanations of hauntings and related phenomena, I lean toward philosopher Peter Kreeft's 3 categories: souls who've been judged and are saved but require a specified term of purification before entering heaven, visitations from blessed souls in heaven, and demonic activity. Thanks so the old Wakr Disney films where the pirate capitan has to do a good deed before going to heaven is correct then. Cool. I'm just trying to understand how visiting the living helps God's plan and how to distinguish between the two.